i dun wanna say hello now. i screwed up that jump. how hard i have trained and prepared for everything. and what did i get today? one underboard and one overboard. you broke your pb today! sorry i didnt keep my promise to prove to him. now i end up having to write reflections. anyway, conclusion is, i love leng jen! 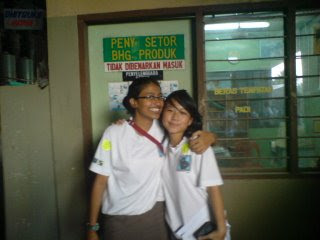 and yea, dear, we will stay as best friends forever! you're the bestest triple jumper in my heart! we'll stay close and tight! tomorrow is the BIG DAY . Leng Jen we can do it! tmr must chiong all the way. i dun care, i am so gonna try my best! this is specially for my dearest bestest hottest coolest trackmate! thanks for always being there for me in track. thanks for going through all the turmoil with me. thanks for encouraging me all along. thanks for fooling around with me. thanks for camwhoring with me after training. thanks for going home with me all the time. Leng Jen, tomorrow we must do our best ok? i need to blog for 3 people now. varsha: my bag is COOL ok! Its not big lah! tsk tsk. yan tian: i love pizza! *hint*. haha. anyway, JULENE LOW has been hounding me for her pics. 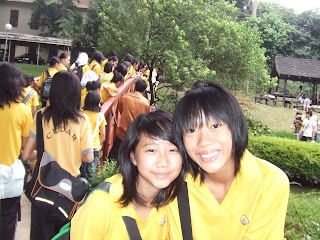 i took a picture with singyi! tsk tsk. scare me. i though my ernie gone! haha. ok enough of self praise! you came to our class today. do you know how much i hate you. your that stupid facem i really cant stand it. stop acting enthu and like you're really concerned. you're damn smart today you know. you screwed up the whole french exam! shall see what kind of results i want! today when i came to school, i was sad. today when i going back, i am happy. jolene had mood swing today. her leg bandage up like elephant. she limped to school like a sad elephant. but she still looks like an elephant. yea i smacked ny books on my table this morning. i am cuter than an elephant ok! jolene lee, why are such a loser? you've made up your mind to chiong all the way. you cant even walk properly and you wanna sprint? you're thinking too highly of yourself. i cant even thrash the person i hate with my own ability. ashley had to do it for me instead. thanks for everything people. if without you guys today, i will probably have cried until now. thanks ashley, badi, julene, si jia, yan tian, taffy, clara, yun yun, natalie, syu, amanda, peiyan, nicole, jin rong, alex, zhi xuan, stephanie, leng jen, tiffany, samantha (2S) etc and etc. and thanks jumpers, especially seniors, sec 2s and megan and yiling. i love you guys. 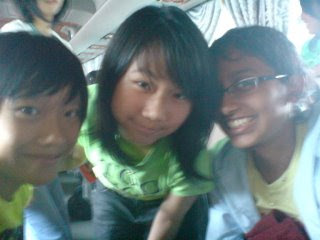 oh and samuel, wei zhen, xuanjie. i'm afraid i will screw up and pull the whole team down! i cant afford to do that! i am soooooo stressed now. yesterday i had a really bad dream. omg i am such a crybaby. i am so so so tired. I gotta do my best. did i make the right choice from the start? perhaps we shouldn't even have met. 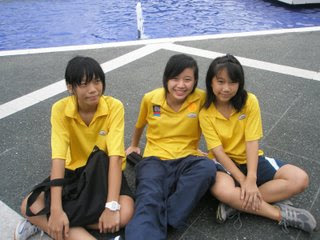 actually today nothing much to say lah. today a new girl is born. her name is Ashley Julene Chong Shu-yun. and one thing which made me quite sad today. he thinks that i am stupid and slow. nevermind i will prove to him that he is WRONG. i will do it. wait for me. haha. julene low u better thank me! today was like so slack lah. 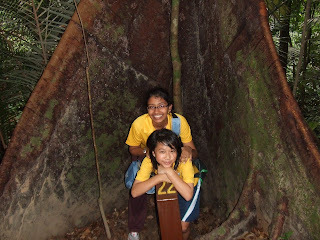 and varsha went PULAU UBIN to FISH? yesterday i had home econs lesson! and i cooked with JULENE LOW SHU YUN. chicken also dunno how to cut. skin also dunno how to peel. potato also dunno how to peel. even gas tap also dunno how to on! summore drop her home econs cap into the curry! i know i have repeated this for like how many thousand times. but yea, i still have to say it! "I love you guys a lot a lot. Really. We've been training together for like so long. Yea. Gone through thick and thin together. You guys are always theere for me, no matter what. Yesterday you all have done your best! and i am really proud of you guys! 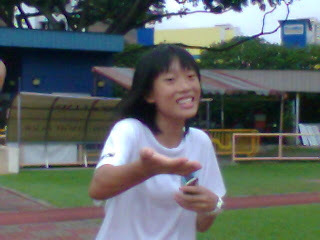 So, jiayous for other events during sports day! break your pb! " ok start from which day? haha, ok start from tuesday lah. erm tuesday usual thing lor. after school go moelc for french class..
so sad right my life. i am getting sick of it. anyway, i guess a lot of people saw samuel at moelc. today is like so super TIRING! 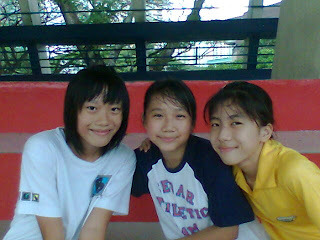 PE everyone was like chionging so fast? and i had to follow! and yea there's no training today. cos mr seem is overseas. there's sec one sports day long jump today! 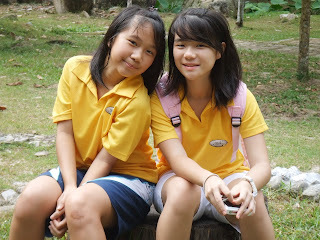 and my dear juniors, yiling and megan took part! i was there to help out lah. see i so nice right! i am really amazed with what you guys have done! 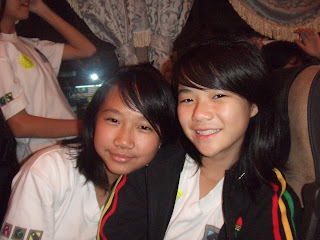 Yi Ling and Megan, you've done your best! so dun be sad about the results ok! you have done really well and i'm really proud of you guys! you can do better next time yea! i will do my best, i promise! jolene jolene! you can do it! i will overcome my fear and do jumps proud! aww i am having slight fever now! i must get well soon. i am so tired now! gotta sleep soon i guess. looking forward to the starting of new term! haha nvm if you didn't get top 5! you did your best yea! looking at all my results, jolene, you ought to pull up your socks! must do your best kay! you got 24th! and you beat him! you're sec 3 and you got that wonderful position amongst the sec 3s and 3s and 5s! so tmr i am sure you can do it! "Tmr 16 March 9.20 @ ITE Simei: Steeplechase All Comer's meet! " ok i shall blog about thursday! i went to cat's house do project! aiyah it was more like some party then project lah! oh and sam super super hyper. oh catherine, you make fabulous cheesecake! i love it you know. 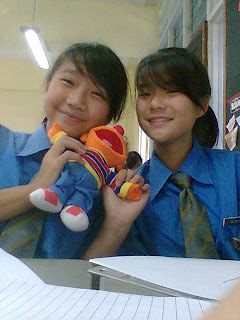 and me, catherine, samantha and xuepiao bought a soft toy at cards and such! haha we all have the same one! i went vivo city with samuel. ok so yea we went to watch STEP UP 2! ha, wendelynn told me that its nice! and yea, its VERY NICE! we reached vivo at like 6 plus. then we went to the foodcourt to eat. and you know we passed by this girl giving out dunno wat paper. so FUNNY CAN! i wanted samuel to say hi to that girl and ask her for handphone number! how crazy can i get?! 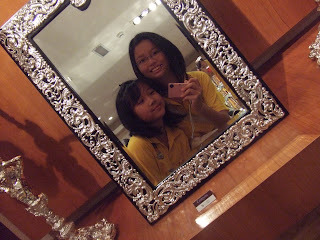 oh yah i remembered we went to the wat St James Power Station. so after that we went erm where arh? oh ACTION CITY i think. and samuel bought a GREEN TOFU! then go walk walk lor. then before we went in to the cinema..."ta da!" and all the DANCERS FROM CEDAR. haha. kimberly was like so FUNNY! i enjoyed the whole movie! haha so after the movie we went down, you know the place near the cruise centre or what you call that. 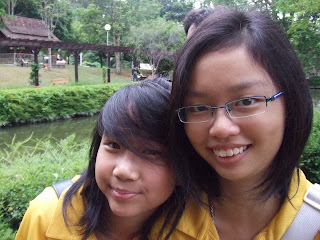 so yea we sat down there though it was wet due to the rain just now. clean the place dry first summore. and after that sadly it was time to go HOME. perhaps after that night, it would be very hard to go out like that already! cos everyone is busy with their own stuff you see. i enjoyed that night seriously. ALL THE BEST FOR YOUR RACE TMR! i so nice right! jkjk. i am not a penguin though. u should say " a fast cute and lovely penguin!" enjoyed myself quite a lot lah! haha. anyway that's not the main point. yesteday my camp ended around 3 plus. then i went out with my friend. we met at pasir ris mrt station then go vivo. 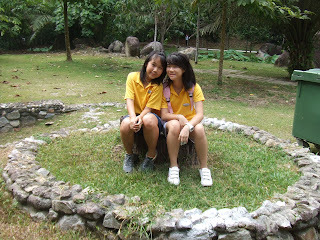 after that we went to you know the vivo city then got this open space at the top. then can see the sea and all. then decided to do something really dumb! we sort of copied the movie lah. then we wrote our wishes on this paper. and folded it into an aeroplane and threw it down! and nat, wow i am SO AMAZED by him! really disappointed with my lousy performance. haiz dun talk abt it alr. but today, wat on earth happened? sad. no words to describe. i am afraid i cant jump anymore. but thanks to my team, which cheered me up! 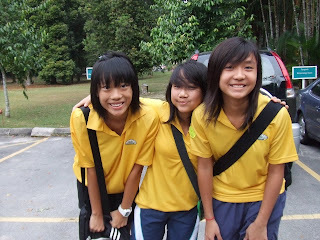 nice nice seniors, nice nice team mates, nice nice juniors! nicole was super nice to me today too! YAN RUI u really ROCK! ok ok. enough abt me. conclusion: jolene is sad now. i dunn owat to say. really. tmr i having sph camp. 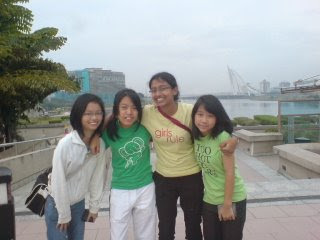 lastly julene, enjoy ur cruise holiday! nxt holiday we go together k? aiyah how can i forget sth so IMPORTANT?! i wanna congratulate sudisha on topping the class for HISTORY! so yea one moment i was SAD AND CRYING. the other moment i was HAPPY AND SMILING. today we got back _____ result. i stared at the marks for a moment. no words came out of my mouth. until like a few minutes later, then i realised i did really badly. cant believe my eyes, even until now. then the whole SEL was spent crying and emoing. the whole class ws sad i guess. and this particular person was really "good" in comforting others yea! she said "remeber to live up to your potential ah!" it spurred me on to work harder. dun let her look down on me. wah she super BIAS can! yah and "being the top higher chinese student in PRIMARY SCHOOL" was the FUNNIEST PART! the huge bunch of us sat at the same table. so yea that cheered me up. at least i still have all my friends! i am sure we can all do better! 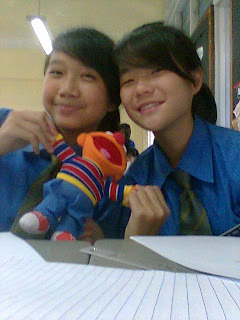 and jolene, you must not slack cos u detest the teacher k! nat! thanks for the note! so SWEET! and then and then, wanna thank everyone. like: cat, xp, boonhui, julene, ashley, varsha, nat, singyi, yan tian, candia, yu shu, hanis, yuan jing, badi, charmaine etc etc. haha .thanks people. oh and i missed out yun yun! yea so thanks yun yun! at least i feel much better now! FRENCH was erm _______ today. fill in the blanks yourself yea! will blog again if i feel like! the best class on Earth. 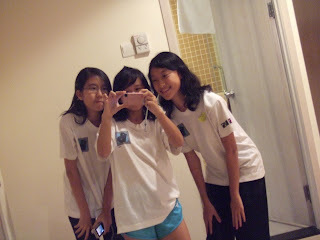 i got this from JULENE'S BLOG! "Jolene Lee, dont be sad okay! 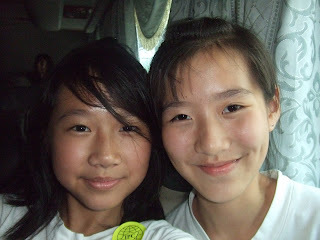 You are the bestest prefect everrr and we shall train everyday during March Holidays! I promised you that for the nice Caramel biscuits right! (: "
ok now i am gonna blog. but i am quite glad that i still have all my friends with me! ok now, training today was nice except for the warm up part. i was really really sad. i tried hard to contain my tears. so it didnt roll down my cheeks. just welled up in my eyes. however, i enjoyed the later part of the training. had circuit training cos it was raining. then after that, someone shouted "Jolene! Jolene!" 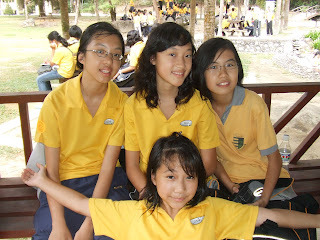 it was tiffany, syuhaidah, yun yun and nat. haha they told me to run for them in the relay. so yea i ran. last runner. wah one round around the old cedar corridor, abt 180m. so i got that thing from nat, and i ran. 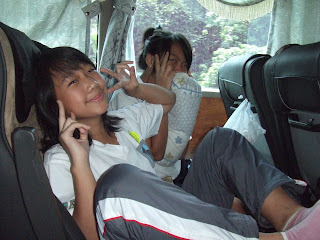 with jacinda right in front. wah she ran like wind. fyi, she's a sec 4 senior. so around the corner, i couldnt catch up anymore. but cannot, cannot let my teammates down yea! so i shouted "jacinda! i love you!" haha. so it was this trick of mine. so dumb of me sia. so yea we ran and ran. and at last we got SECOND! after all the relay and stuff i was really tired. but i could sense the tean spirit we all had. cos in Cedar jumps i found my really really good friends who are always there for me. 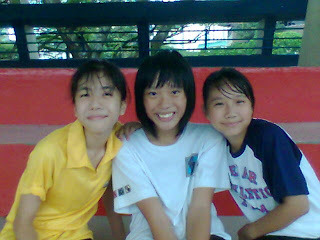 Leng Jen: I wont forget all the great times we had together camwhoring and doing silly stuff with the medicine ball! Jue Ying : I wont forget the times we did abs exercises together in the past; the times we took the same bus home wif leng jen and talk abt _______. 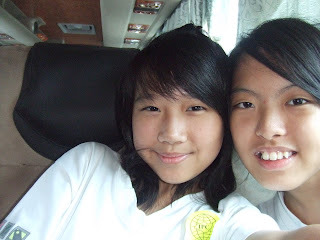 Jing Yi: Will always remember the times we had on the cab! haha. Natalie : Thanks a bunch for all your help and encouragement! It motivated me to work harder you know. Yun Yun: cute girl! haha thanks for everything, all from the start! Syu : Thanks for writing me letters! haha. 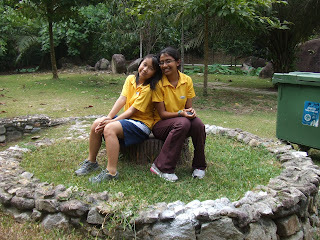 (: and thanks for guiding me all along! Jie Wei : "Lao shi!" haha. thanks for all the help! must train hard yea! Tiffany : Thanks for all your encouragement yea! you're really cool! I LOVE YOU GUYS. REALLY. NEXT, i wannna thank all my friends too! but because of your presence, i feel really blessed. 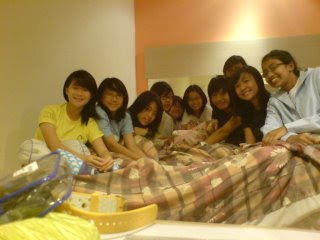 catherine, xuepiao, julene, singyi, candia, boonhui, varsha, nat, yantian, ashley, yuanjing, yu shu and others which i forgot. wont forget all the great moments we've shared together! i love you guys ! err so random. i am gonna be so super busy man! i must comment on CANDIA! her socks are sooo cute! YUAN JING IS SUPER SUPER NICE! erm cool hairstyle, cool laughter and umm her blurness makes her cute! must say thank you arh! ok so thats abt all! of course have others lah. but i lazy to post so many lah. i shall upload my pictures now. although not everything is here.